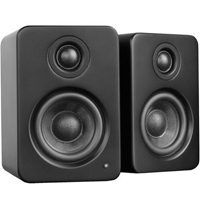 Play audio from nearly any device with the pair of matte black Kanto YU3 Powered Speakers. They feature an RCA, 1/8" mini, and two optical TOSLINK inputs, plus built-in Bluetooth for wireless connectivity. Each speaker has a 4" woofer and a 1" tweeter, outputting 30W each. For added convenience, an IR remote is included.